Nitya Agrawal is in the class of 2017 and is an Empower fellow. She has been interning in Mexico this summer. For the past three weeks, another intern and I have been meeting and interviewing several vendors a week in order to form the artisan database. Usually, we meet with people on Tuesdays, Thursdays, and Fridays, and between the two of us we interview at least two people on one day. Last Friday I met with and talked to around nine people! Recently, I have been scheduling interviews with clients using my local phone and have been talking to groups of local women alone. It still amazes me to think that I am in a small town in Mexico and having Spanish conversations with locals on the phone! The interviewing experience has been surreal, but fun, exciting, and life-changing. During the first week or so, we met with existing clients. At that time we only had around nine clients. However, Elly (the director of Human Connections), the other intern, and I asked for referrals, met with more people, and now we have around 26 clients. It is amazing how fast that number has expanded! Many of our clients have at least three children and have only attained a primary school level of education or less. The people we meet are often very excited to tell us about other artisans or vendors in their neighborhood, and some are even willing to let us meet their acquaintances in their home or store. Everyone is always so open and welcoming. Last Friday I met with Silvia, a hair-stylist, at her salon by myself, and she introduced me to around five other people. One person sold tablecloths, one cleaned houses, two sold birria (meat stew), one sold sandals in the plaza, and one sold sweets. There was such a large variety of businesses represented. I stayed there for around half an hour, just explaining Human Connections and hearing them excitedly talk about their products. 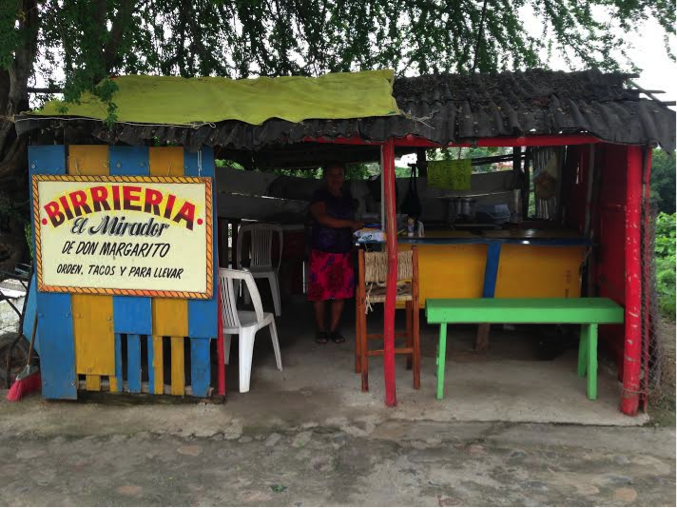 Afterwards, Adelayda, who sells birria, led me down a scenic, hilly street to her small birria stand. Then she kindly showed me the direction home. I have learned and grown a lot as a person from this interview process. I learned that as long as I know the language, I should have the confidence to speak with people from various corners of the world. I realized that I cannot even imagine the different opportunities life can bring unless I get thrown into things. I also realized that people really appreciate it when others take an interest in their work. I am sad that next week is the last week that I will meet people in Bucerías, but I will always remember their passion and extreme generosity. Silvia, her daughter, and I.